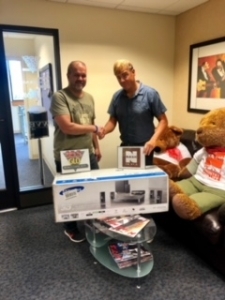 973 NASH fm, Central Illinois BIGGEST Country Station is proud to be a part of the Walter Bros./ St. Jude Summer Rides, we wanted to pitch in with another sweet auction item for the BIG finale party on September 8 at Walters Brothers Harley Davidson; it’s a $500 Home Theatre System we donated! The big finale party will feature live music, auction and someone wins A NEW Harley-Davidson Anniversary Forty-Eight or a New Harley-Davidson Street Glide ! There are less than 5 stop left on the St Jude Summer Rides, so get your chance at three qualifiers every 15 minutes between 6:45 and 8:30! Take a ride with us or meet us there! Be one of the 28 qualifiers this Thursday to get your chance at winning a BRAND NEW 115th Anniversary Sportster 48! Be at Walters Brothers Harley Davidson by 5:15pm to get entered for your chance at the first 3 qualifiers for the Anniversary Sportster or 2 qualifiers for a New Street Glide . Another 25 Free Qualifiers, along with some swag from the grab bag will be given away at Whiskers! The ride leaves at 5:30pm! *** — at Walters Brothers Harley-Davidson. See the whole list of stops here! Stan Weibler accepts our St. Jude donation from Brian & the 973 NASH fm crew!